St. Ronan’s Primary School serves the town of Innerleithen. 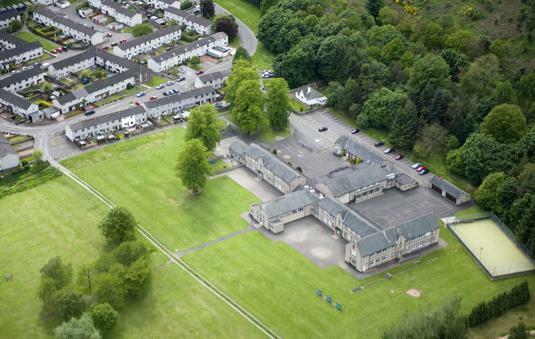 Built in 1957 and located within some five acres of playing fields at the east end of the town, the school commands one of the most attractive situations in the Scottish Borders. To the south lies the flood plain of the River Tweed overlooked by the forested area of Caddon Bank and Plora and to the north the scree slopes of Pirn Craig. The school presently has 261 pupils on P.1-P.7 roll. The Nursery Class caters for 80 pre-school children. (Nursery and Ante pre-school). There are currently eleven mainstream classes and a Spectrum class for children with additional needs. The school roll is projected to increase over the next few years. The school accommodation includes a large dining/assembly hall with stage, a gymnasium with changing rooms; access to a computer suite, as well as eleven classrooms and a Nursery. The school boasts a well-resourced library with an excellent range of reading resources. We have a large kitchen with state of the art equipment, producing tasty meals for the pupils and staff. St. Ronan’s is a community school, with two dedicated rooms which provide facilities for many community groups. These can be hired out along with the school’s halls – see Community Centre pages. This wing also accommodates a classroom occupied by the Sepctrum class. The facilities of the school complex are available for use by community organisations in the evenings. Please see the Community Centre area of this website for a booking form. Outdoors there are extensive playing fields which include two football pitches, while tarmac and grass play areas surround the building. An all weather play surface exists and is a facility for school and community use. At the west end of the school there is a pre-school/infant purpose built play area. The playground has been enhanced by the installation of custom play markings. Trim-track style play facilities are available for the middle and upper school at the east end of the school. A woodland nature trail provides rich educational opportunities and there is also a biodiversity area adjacent to the playing fields.